Growing up in New Jersey really limits many opportunities to enjoy the outdoors, especially when it comes to finding some decent backpacking tips and locations. There are tons of campsites around the tristate area that you can pay a fee to rent, but they are right next to other campsites (and people). But, do any of you prefer the style of camping that allows you to really live off of nothing and just appreciate the outdoors? Take a look at some of these backpacking tips that you could use during your next backpacking trip! 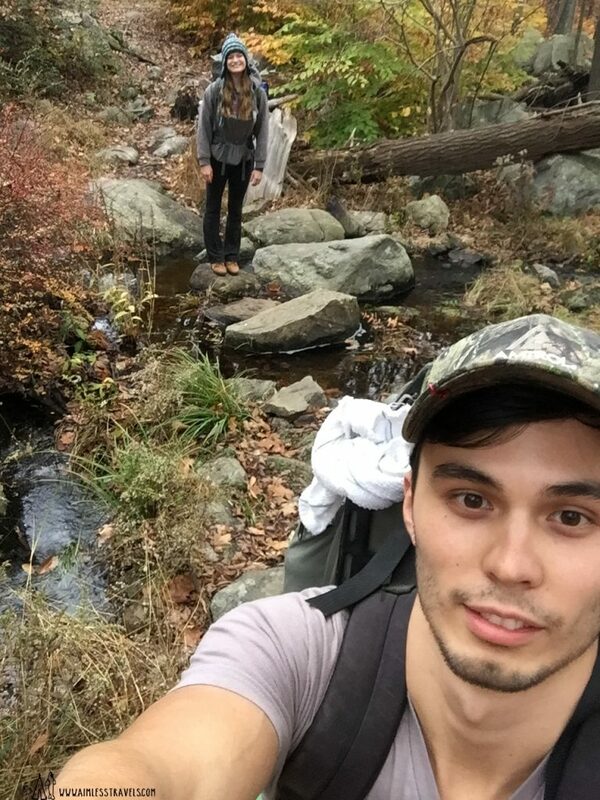 Many people assume backpacking around New Jersey is impossible. Unlike out west, many areas around here forbid backpacking, camping, and open fires unless it’s at an official campsite. BACKPACKING TIPS #1: Yes, it IS possible to backpack close to New Jersey! Harriman State Forest is located in New York and allows backpacking within a certain distance to two lean-to shelters: Bald Rocks and Tom Jones. Parking for these sites is located on Route 106, at GPS location 41.23038 N, 74.13996W. The parking is free and overnight parking is also permitted. The Bald Rocks lean-to shelter hike can be started on the same side that you parked on. The Tom Jones Shelter hike can be accessed on the other side of the road. Tom Jones Shelter area: Both offered different hikes. The trip we took in October was only about a 20 minute (0.50 miles) hike to get to the spot that was a permitted camping area. Since this was such a short hike, there were a lot more campers around here. We were looking for a place that was away from people (granted, that is hard for a place like New York…), so we were a bit disappointed when a group of hikers decided to pitch a tent right next to us at about 11:00pm. BACKPACKING TIPS #2: We’d suggest the Tom Jones Shelter location if you’re not much of a hiker, but still want to experience an actual backpacking trip near New Jersey. Bald Rocks Shelter area: The trip we took in November was a much longer hike than either of us had anticipated. The trail was also filled with a lot of different types of terrain. I’m definitely not the best hiker out there (Ok, I admit, I get tired pretty quickly), but even David was exhausted by the end of this hike. It took us about an hour and a half (1.5 miles, although it felt longer) until we were able to find the shelter and a place to pitch a tent. However, since this was a much more difficult hike, there were a lot less people camping in this area, which is exactly what we were looking for! We were able to pitch our tent in a peaceful spot that overlooked the forest below us. BACKPACKING TIPS #3: We’d suggest the Bald Rocks Shelter if you love hiking and don’t mind camping with little to no equipment! The less you bring here, the easier your hike is going to be. This trail definitely had some challenging obstacles, that Shelby consistently tripped over! Sitting at the trailhead in Harriman state park before our trek out to Bald Rocks Shelter. One of the few selfie shots we got on that trip. 2. Temperature: What Should You Expect? BACKPACKING TIPS #4: If you’re planning on backpacking in the fall, plan for cold weather! While the hike may not feel very cold, the temperatures drop significantly at night. If you’re someone like me that doesn’t do well in the cold, look into getting a sleeping bag that is well equipped for cold nights. I purchased a zero degree bag, but this may not be necessary for you if you don’t get that cold. David has a 32 degree sleeping bag and does just fine during cold nights. Quick Note: Our favorite time to go camping is the fall. 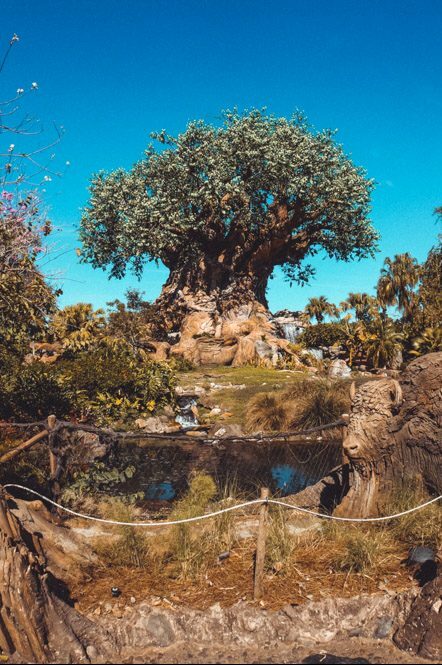 The foliage is just too beautiful to resist! BACKPACKING TIP #5: Don’t leave your house without these backpacking essentials. You can pick and choose what you feel is necessary, but we concluded that these are all items that we’d prefer to have with us during our backpacking adventures. Use collapsable water containers to save room. We bring one for each of us and our favorite brand is Platypus collapsable 1.0L containers. They’re durable, easy to clean, and stay sealed. The last thing you want to have to worry about while hiking is a leaky water bottle! You can fit a lot more in these and they sit a lot more comfortably on your back. You’re going to want to find one that is somewhat water resistance, has a rain cover, and fits comfortably on your back. Backpacking can be a long-term commitment and you don’t want to have an achy back halfway through your hike! Teton makes durable backpacks that may be just right for you and your backpacking essentials! You never know what kind of terrain you’re going to experience or how long of a hike it’ll be. You don’t want to be uncomfortable or get hurt! Even if its nice and warm out, having a sleeping pad is the difference between tossing and turning all night and actually waking up feeling refreshed. If you’re going in the fall or winter, make sure you bring an insulated sleeping pad. The extra insulation helps you from becoming a popsicle overnight. We love the brand Klymit Statik v2 and would highly recommend it. You can find a small set of dishes and utensils that are plastic on Amazon for a reasonable price. They’re light and super easy to pack. You’ll need dish soap to wash your dishes and to eat with – don’t forget it unless you’re bringing food that doesn’t require dishes! Remember, you’re really roughing it. That means nothing but your clothes to wipe your hands on or blow your nose into. Grabbing some extra paper towels is always a good idea. Amazon offers you the ability to buy in bulk. Our favorite brand is Bounty Paper Towels. This is easy to pack and allows you to heat up water or a pan for easy cooking. We’d recommend a camp stove that is light, small, and easy to pack. The Bisgear camp stove is just that. As an added bonus, it comes with a full set of utensils! We recommend a simple keychain kit that you could easily attach to your keys. That way, you’ll never leave without it. Remember, nature is your bathroom. Ladies, I’d suggest bringing toilet paper for yourselves if you don’t feel comfortable with the “shake” method! The amount of clothes you bring depends on how many days you are camping, of course. But, just remember, the lighter your backpack, the more comfortable the hike for you will be (Unless you have someone willing to carry all your stuff)! 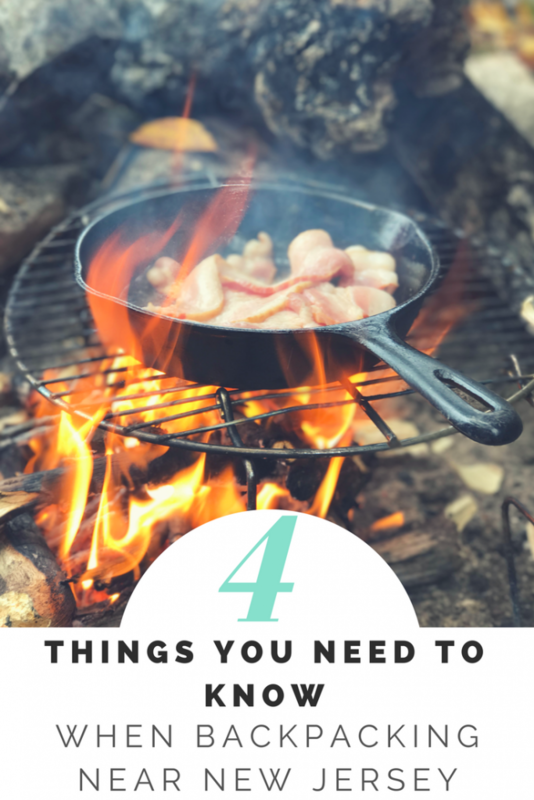 If you had asked me what my favorite part about camping was, it would definitely be the food! Bring foods that are easy to cook, such as eggs, bacon, soups, and hot dogs. 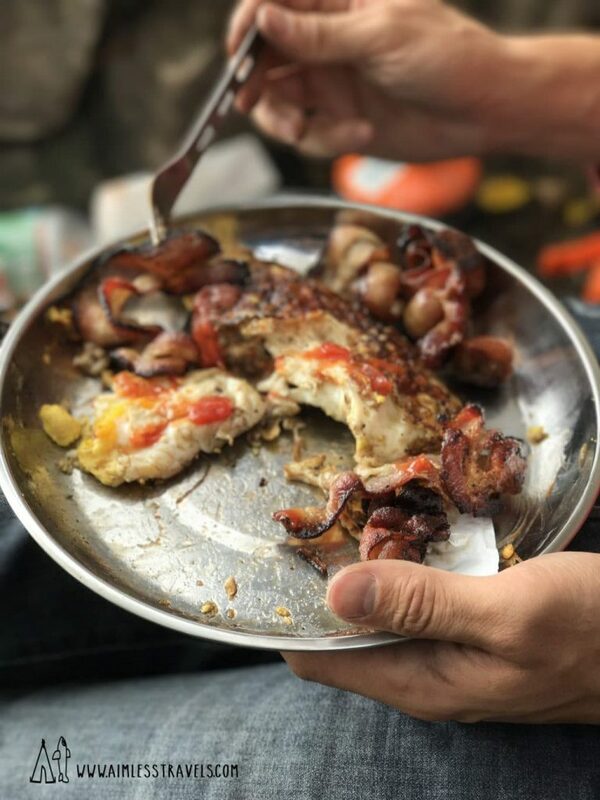 Do I spy eggs and bacon in that backpacking travel cookware? BACKPACKING TIPS #6: It’s easy to make mistakes when you go on your first backpacking trip. Before you go, you should really understand some of the things you shouldn’t bring on your trip (and some mistakes we made that you may want to avoid). The first time we went in October, we decided to save room in our bags by not carrying a tent. Big mistake. While David’s hammock is made for two people and is extremely comfortable to sleep one person (The brand we have is Eno, but we’d also recommend Eagle Nest, which is equally as effective and a bit cheaper), it’s just not meant for two people overnight. It was a tight squeeze and difficult for either of us to move around at night. We definitely carried too much during our first backpacking trip, which was okay since it was experimental. For example, we thought it would be cool to bring in a cast iron pan to cook our food. While it was ok for the short hike we went on to the Toms Jones shelter area, general backpacking tips would NOT suggest bringing it on any longer hikes. It was way too unnecessary. David proudly showing off his cooked bacon in his backpacking travel cook set. Never knew cooking breakfast could look so good! Yummy bacon sizzling up in a cast iron skillet. 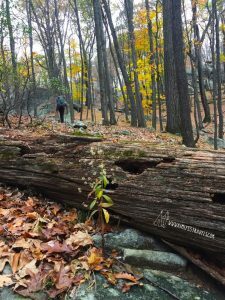 Excellent backpacking on the Appalachian Trail in scenic northwest NJ…there are many more hiking and camping opportunities in Warren and Sussex Counties in NJ. Look up Worthington and Stokes State Forests and Wawayanda State Park. We had such an amazing time, both times we went! Fantastic list! Will be checking these out for sure! Thank you! Hope you found them beneficial! Awesome camping tips! Great post! Thanks! You’re welcome, we hope that these tips help you out in your future adventures! Your post is helpful to avoid the mistakes. Thank you for sharing!